Sunshine, inspiration, positive energy and abundant plants are a recipe for a great days work. ‘Hard’ landscaping is our favorite activity, the feel good factor for everyone, keeps the job fun. We had imported some soil and large rocks which we arranged between the gum and acacia trees. 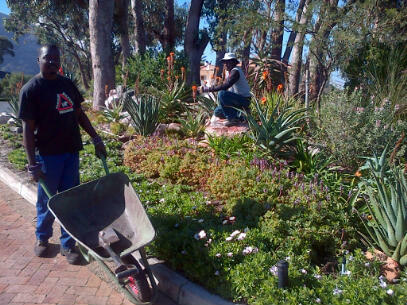 We followed this by populating our berm with aloes, strelitzia, dietes,agapantha, ground covers and finally mulch. A bright, fresh and inviting arrangement at the entrance to one of biggest gardens in Hermanus.